Lee Unwin: End of XC Ski Season? End of XC Ski Season? Well it looks like the end is near, so I decided I better get out while the gettin was good. Went for a 4 hour ski on Sunday then a 3 hour ski on Tuesday. The routes are 3 different parks that are all connected by a short hike to each. The grooming is excellent and the trails are fast. In the back ground is Black Hawk Ski club, the park that lies in the middle of the other two. 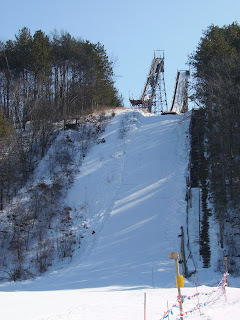 It has ski jumps, a biathlon course, down hill, and lighted trails. This is also the place where they hold Wed. night mountain bike time trials so you will probably see these pics again in the summer. If you live in a place that has snow but insist on riding the trainer get with the program. I am more blown from a 3 hour ski than I ever am from a 100 mile ride. Its blowing 30 miles per hour today so I'm going to run the 5 miles to our Center because it looks like I will have a nice tail wind the whole way there. Did I ever mention that I get to ride single track and off road for about 5 miles to our office everyday in the summer, have to remember to show you pics of that this spring.